Once a Championship has started, Clans can no longer join nor change league until the end of the Championship. It is not possible for a match to end in a tie during the final phase: If this happens, one of the clans will be randomly selected as the winner. 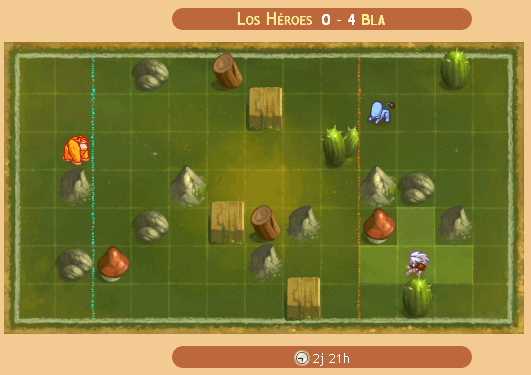 A battle is launched when two clans fight each other. A battle lasts for 48 hourss and the clan with the highest score at the end of the battle wins. A battle takes place in a specific location. You will be able to place your dinoz in this locations if you want them to take part. A player can have up to 3 dinoz in a battle, but a clan can have no more than 45 dinoz in a battle. At the top of the screen you can see the current score of the battle and at the bottom of the screen is the amount of tile left until the end of the battle. The Dinoz who have joined the battle can move to a square, they must then wait a specified time before being able to move again. It's possible to accumulate actions if you don't use them straight away. You can click on a dinoz to move him or to see who owns him. Only a Dinoz' owner can move him. Good organisation between all clan members is essential if you want to win the battle. As you can see on the battle display, each clan has a scoreline, blue for the clan on the left and red for the clan on the right. Every 60 minutes, clans win the points corresponding to the advancement of their scoreline. Therefore, in the example above, every 60 minutes, the clan on the left (blue line) will win 2 points and the clan on the right (red line) 4 points. The scoreline is positioned in the following way: it indicates the position of the first dinoz in the clan who hasn't been defeated by an opposing Dinoz. Be careful! An opposing Dinoz can launch an attack which will push back your scoreline, this will prevent you from scoring points at the point of the next calculation. Reminder: A battle lasts for 48 hours and at the end the clan with the best score will win. The placement of your dinoz is therefore extremely important if you don't want to find yourself at a numerical disadvantage during a fight. If a Dinoz attacks an enemy from behind, and it is a solo attack, the enemy will be taken by surprise and will not be able to call for backup. This fight will therefore be one-on-one. If a dinoz dies during a fight, he is removed from the battle and will no longer be able to rejoin it. A dinoz can also choose to quit a battle and return to his clan's scoreline, this will allow the dinoz to heal and then return to battle..